Your one-stop shop for printing, copying and stationery needs! Formed in 1969, we are a small family business committed to providing UK based companies, clubs and individuals with a variety of business stationery including, forms, calendars, menus, newsletters and other printing requirements. We are continually investing in the latest equipment and facilities so that we are able to keep up with customers' requirements. The latest Ryobi 3302H offset litho press, capable of running 10,000 A3 copies an hour in two colours, sits alongside a single colour Heidelberg. These two machines give us the flexibility needed in todays market. 2004 saw the introduction of our first Xerox digital printer. Quality, short run, full colour is now an easy option. Business cards, postcards, leaflets, calendars, advertising material, property particulars can all now be printed economically in small quantities. Within a year the demand for this service was so great that a second machine was installed followed in 2006 with the installation of a new 52.52 machine, allowing even greater speed and flexibility. In 2008 the 52.52 was upgraded with a Docucolor 5000. In 2012 we replaced our Xerox machine with the latest Ricoh Digital Press, the Pro C651EX, giving us even better quality and the ability to handle a wider range of materials with a massive selection of papers - ranging from 45gsm to 350gsm gloss art in a variety of colours - we pride ourselves in the knowledge that we can produce our customers needs quickly and in a cost effective manner. 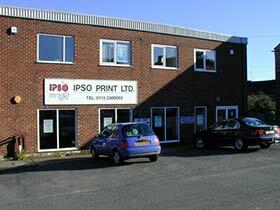 On the litho side we have installed a direct to plate system giving the best possible quality of print. With a library of well over 1000 typefaces to select from and more than 90,000 clip-arts, we are able to offer a full design service from a simple invitation to a complete corporate design for your company or association. Our team is here to give advice and our typesetting department can provide a quick turn-round of proof copies to ensure that the work is correct. Our in-house print finishing department handles booklet making, collating, numbering, cutting, folding, perforating and binding. With all this under one roof, we can dispatch goods anywhere in the UK overnight to ensure that the final copies are with you the very next day! Our prices are low allowing you to have the best value service in the North of England. Please contact us and we will be happy to send you the latest price list. We can also open "customers own artwork", and we are able to take files from almost any media as long as it's in PC format or saved as a pdf.